Historically, most durable timber needs were able to be met from public forest resources. Species like red ironbark and red gum were easily obtainable and commonly used for railway sleepers, power poles and jetty/bridge construction. Over the last 40 years there has been an enormous reduction in access to timber resources from public forests as a result of conservation and fires. For example, in Victoria the Forest Commission reported 25,000 ha of public forest harvested in 1979. Approximately 37 years later (2015-16 financial year), this has dropped to just 2548 ha harvested. In contrast, during this period the demand for wood increased dramatically with Australia’s population growing by more than 40%. In the building industry, these cut backs have been largely offset by softwood plantation resources such as radiata pine however, supplies of higher durability timber have relied on imports of species like merbau to make up the shortfall. In recent years, measures taken to reduce imports of illegally logged timbers have further impacted the availability of durable hardwood. For example, some investigations have suggested that more than 70% of Indonesia’s logging is illegal (Kyoto Review of SE Asia). Against this background there is a glaring need for durable eucalyptus plantation resources to be grown in Australia. Sadly, very little attention has been given to this need by policy makers and industry alike. Nevertheless, there are several small organisations in Australia and New Zealand that have identified the need for durable eucalyptus plantation development and have made considerable progress in this area. In Australia, these groups are predominantly privately funded and growing a range of species for both sawlog and post production. Unfortunately, there is very little support for this sector from the industry and much of the necessary research and development is also being undertaken and funded by the same organisations. In recent years, some casual exchange visits have occurred between some of the organisations growing durable eucalyptus species. During these visits, there has been sharing of knowledge, research and development. In at least one situation supplies of seed have even been shared between groups for trials. There have also been conversations about the potential for sharing equipment for operations. These exchanges have been highly valued by those involved. They have given the opportunity for organisations to learn from one another and challenge ideas and methods. In several cases this has led to advancements in systems or equipment, which have been highly valued by the organisations involved. Most importantly, it has developed several new relationships with like-minded and enthusiastic forestry professionals. New Zealand Dryland Forests Initiative. The proposal is that every year each of these organisations hosts a Durable Eucalyptus Grower’s Forum. The Forum is planned to be a two-day event with day one being a chance to hear presentations from each organisation and day two a chance to undertake field visits to the hosts’ sites. The events are planned to be a non-profit activity with attendees paying for their own travel and accommodation and a small fee to cover hosting and facilitation costs at the discretion of the host organisation. Involvement is to be by invitation only to ensure all participants are relevant to the objectives of the group. 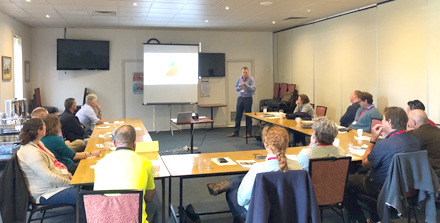 To kick off the Durable Eucalyptus Grower’s Forum, Heartwood Plantations and its partner Radial Timber Australia hosted the first event in Yarram, Gippsland Victoria. A total of 16 participants from Australia and New Zealand came together for the invitation-only event represented by six organisations (all those initially invited plus Chris Swadlling, CEO of Ironwood Australia) actively involved in the growth and processing of durable eucalyptus plantations. Day one was a workshop which provided each organisation the opportunity to present an overview of their current operations, followed by a presentation on current innovations, research and development. There were many discussions during the day and, despite the geographic separation of the organisations, there was plenty of common ground to explore. Topics such as site preparation, species selection, thinning, weed control and product development provided excellent opportunities to share ideas and experiences. 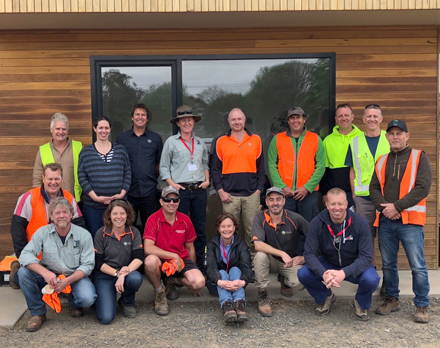 Day two was a field day with participants spending the morning touring the recently commissioned green and dry mills of Radial Timber Australia in Yarram. The group viewed results from a range of trials for both posts and sawn products from plantation-grown timber. The afternoon was spent visiting several properties managed by Heartwood Plantations, featuring species such as spotted gum (Corymbia maculata), yellow stringybark (Eucalyptus muelleriana), red mahogany (E. botryoides), red ironbark (E. tricarpa) and coast grey box (E. bosistoana). Heartwood Plantations has been growing durable eucalyptus species in Victoria since 1998 and currently manages about 1,500 hectares of plantations. Species include spotted gum (Corymbia maculata), yellow stringybark (Eucalyptus muelleriana), silvertop ash (Eucalyptus sieberi), southern mahogany (Eucalyptus botryoides) and small areas of coast grey box (Eucalyptus bosistoana), sugar gum (Eucalyptus cladocalyx) and red ironbark (Eucalyptus tricarpa). Heartwood Plantations operates in predominately winter maximum rainfall areas of 650 to 1200 mm per annum. Radial Timber Australia (RTA) is the world’s only commercial radial sawmill. The new RTA sawmill was commissioned in 2017 and currently processes around 12,000 cubic metres of class 2 durable timber per year. RTA currently purchases all of its logs from VicForests (public forests) these are predominantly silvertop ash and brown stringybark. In time RTA will transition to plantation material as resources mature. RTA and Heartwood Plantations are also involved in a range of minor product markets including firewood processing and posts/poles for fencing and decorative markets. In 2019, the Durable Eucalyptus Growers’ Forum will be hosted by Super Forest Plantations in Northern New South Wales to continue the knowledge sharing and collaboration in research and development. Register your interest in being part of Durable Eucalyptus Growers’ Forum by contacting Jon Lambert or Mark Wright.